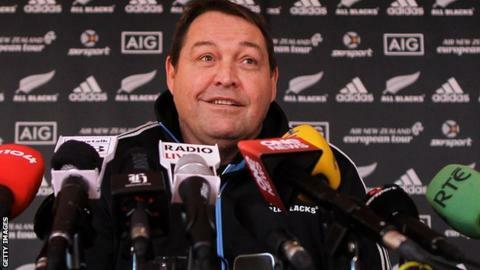 New Zealand head coach Steve Hansen has named five uncapped players in his 35-man training squad ahead of three home Tests against England in June. Lock Patrick Tuipulotu, hookers Nathan Harris and Liam Coltman, half-back TJ Perenara and centre Malakai Fekitoa will join up at two training camps. Hansen will name his official 31-man squad for the series on 1 June, ahead of Tests in Auckland on 7 June, Dunedin 14 June, and Hamilton, 21 June. England name their squad on 15 May. Forwards - Keven Mealamu, Nathan Harris, Dane Coles, Liam Coltman, Charlie Faumuina, Tony Woodcock, Ben Franks, Wyatt Crockett, Owen Franks, Patrick Tuipulotu, Brodie Retallick, Jeremy Thrush, Dominic Bird, Sam Whitelock, Jerome Kaino, Steven Luatua, Sam Cane, Liam Messam, Victor Vito, Richie McCaw, Kieran Read, Luke Whitelock. Backs - Tawera Kerr-Barlow, TJ Perenara, Aaron Smith, Aaron Cruden, Beauden Barrett, Colin Slade, Ma'a Nonu, Conrad Smith, Ryan Crotty, Malakai Fekitoa, Cory Jane, Julian Savea, Israel Dagg, Ben Smith.